With the sheer number of arts-related events in San Francisco, one might mistake the city as one of America’s largest metropolises, but in fact it’s California’s fourth largest city. San Francisco has however had a long tradition of embracing arts on the cusp, reflecting its vibrant and diverse citizens. The city hosts an array of film events throughout the year, including the world’s oldest and largest gay film festival, a number of ethnic-focused festivals in addition to playing home to an active filmmaking community. At the heart of it all is the annual San Francisco International Film Festival – America’s oldest – which will celebrate its 54th edition from April 21 to May 5 (Check out the festival’s lineup here and here). SFIFF is produced by the San Francisco Film Socity, which offers a broad scope of programming, youth education and filmmaker services throughout the year. The group says it presents over 300 films per year and its educational initiatives reach 15,000 students, but its marquee event is, of course “The International,” as organizers are heard to refer to the festival. “The San Francisco Film Society encourages the progressive evolution of film culture and individual lives by celebrating the transformative power of the moving image in all its forms. Through a combination of intelligent programming and exemplary service, it creates singularly vital experiences for audiences of all kinds,” the organization states on its website. 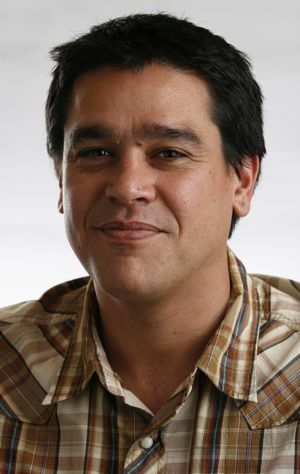 Headed by Graham Leggat, SFFS’s executive director, the San Francisco Film Society is at the forefront of film organizations in the United States. Leggat is assisted by programmers who shape the annual festival. Spearheading the programming team is Rachel Rosen with fellow programmers Rod Armstrong, Sean Uyehara and Audrey Chang. The four offer insight to what makes SFIFF “tick” and their selection process. Similarly to other programmers who have participated in these profiles (links below), they encourage filmmakers submitting to the festival to “read directions” and “make sure your DVD screener works.” But they also mention some other general thoughts on their personal tastes, though they emphasize that SFIFF routinely offers a broad spectrum of current worldwide cinema. 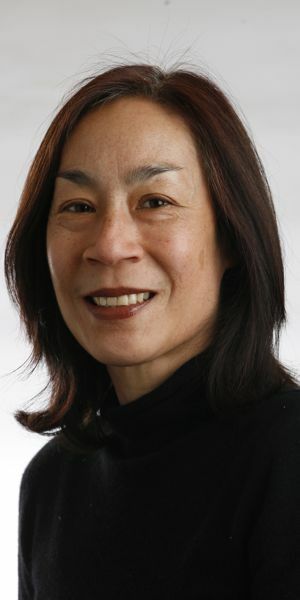 “My personal feeling, having observed and participated in the selection process for close to five years now, is that I find the process of editing a film is similar to programming in that it is a collaboration between trusted colleagues and advisors who through discussion and debate create a final product that is balanced, adventurous and innovative,” comments Chang. 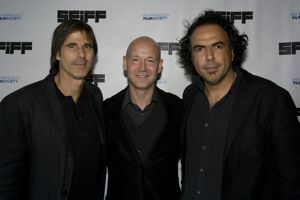 Graham Leggat, executive director of the San Francisco Film Society with Walter Salles and Alejandro González Iñárritu. Photo credit: Tommy Lau, courtesy of SFFS. Below are programmer profiles. In the late summer and autumn, iW also profiled programmers from four other major festivals as well. iW will have more festival programmers spotlighted in the Filmmaker Toolkit in the coming months. I started out after college working in film publicity in New York. After a few years I went back to school to get my MA in the Documentary Film Program at Stanford. While I was working on my thesis film (which took me an embarrassingly long time to complete), I got a seasonal job at the New York Film Festival and then another seasonal position at the San Francisco International Film Festival and worked at both festivals for several years. And I just got hooked; I discovered that I was more interested in and suited to programming than filmmaking. After graduating, I worked for a year at Film Forum in New York and then returned to San Francisco to take a full time programming job at the SFFS. In 2001, I moved to Los Angeles to become the Director of Programming for the Los Angeles Film Festival and then in 2009, I returned to San Francisco to become Director of Programming here. Director of Programming, Rachel Rosen. Photo by Pamela Gentile, courtesy of SFFS. San Francisco is a great city festival with a reputation for quality and a fantastic history. One of our filmmakers last year told me that we’re the most “European” festival in the U.S. which I think means that we’re known for the internationalism of our program, our willingness to show challenging work and an atmosphere that keeps the focus on the films. Which is not to say we don’t have fun; we are a celebration, too. Like most festivals, we serve a variety of constituents, but I think our main task is to bring great films to our audience and great audiences to our films. We’re not heavily invested in the concept of breaking films for the industry or competing for premieres with other festivals internationally, but in the idea of supporting great films at whatever stage makes the most sense – be it as a premiere, as word of mouth support before a release or as a retrospective. I think that the festival’s role as a guiding force for audiences is more important than ever. We are like a matchmaker for films and viewers. Recently there has been a proliferation of ways to see foreign, independent and documentary films, but those new platforms and the choices they involve can be daunting or overwhelming to movie watchers. Organizations like the San Francisco Film Society and the festival that have established trust with a local audience are going to continue to play an important part in bringing audiences and films together. 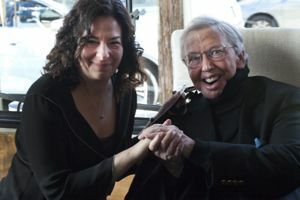 Rachel Rosen with Roger Ebert in San Francisco. Photo by Pamela Gentile, courtesy of SFFS. I know a lot of festivals are involved with getting films out to a wider audience than their local one, but I really think that the best thing a festival can do for film is to help keep local film culture rich and audiences engaged. I think that the constant with festivals is that they fulfill a desire for communal experience. Get your film in as early as you feel comfortable sending it; things never get less hectic for programmers closer to the deadline. Make sure your screener works. Because we’re very much an international, general interest film festival that tries to show a very broad spectrum of film, we’re not looking for any one specific type of film. We’re looking for films that excel at whatever they’re aiming to do and that speak to us on some level, whether it’s, intellectual, visceral, visual or all of the above. The city plays itself plays a pretty large role in augmenting the experience of the filmmakers. It’s a place that most people are very happy to come to. And it’s a place where there is a very enthusiastic and engaged audience that visiting filmmakers enjoy. The festival has one of the oldest schools programs in the country, so many filmmakers will interact with students from the elementary school to college level, either at a school or at a special festival screening. I know that those screenings are really memorable for visiting filmmakers. I also think the fact that we’re a year-round organization is a huge advantage to many festival films. Maybe we will support a festival film for a one-week run on the SFFS screen during the year, or a filmmaker will go on participate in one of our education programs, or receive funding or fiscal sponsorship for their next film through our filmmaker services. For audiences, visiting filmmakers are a huge draw and part of what makes their experience at the festival unique. We also have some special never-to-be-repeated programs in our live and on stage section. Even though we’re a big festival with a sizable audience, we’ve managed to keep things relaxed so that the interaction between visiting guests and audiences is pretty open and comfortable. 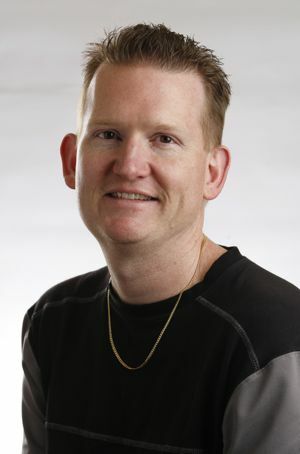 Programmer Rod Armstrong. Image courtesy of SFFS. Before joining the Film Society in 2005, I wrote about film and was the Editor in Chief for Reel.com. I have had a life-long affinity for films and remember dragging my parents to Herzog and Kurosawa retrospectives in my teens. Beginning to weary of writing about movies, I turned to programming as a way to share my enthusiasm for cinema in a more collaborative and curatorial way. Besides its stature as the oldest film festival in the Americas, SFIFF is one of the finest audience-oriented festivals in the world. We have an avid and engaged community of film aficionados who see SFIFF as the high point of a festival-packed city. In addition, the Film Society offers an ever-expanding roster of services for filmmakers, including grants and classes, and for filmgoers, such as a robust Fall Season of various mini-festivals and one-offs and weekly runs of art house films at the SFFS Screen. Attracting a younger audience is one of the key elements to long-term flourishing, so SFIFF has broadened its range to include new media presentations, increased live and on stage events, and a section focusing on genre titles geared toward younger generations. First off, please send a DVD that plays! Offer something new, show your craft, make sure the film is pretty close to the finished product because we will be treating it as such. At the most essential, I think we’re looking for a good story, well told. Something surprising is always welcome. The San Francisco Bay Area is a very important market for filmmakers and film viewers. Viewers take chances on new work and are never less than fully engaged while filmmakers take advantage of being one step removed from centers like Los Angeles and New York to craft independent, idiosyncratic, and important work. Programmer Sean Uyehara. Image courtesy of SFFS. At the time, I was working on a Ph.D. (that I didn’t finish) at USC on the history of “new media.” One of the first programs I worked to bring to SF was the interactive DVD-ROM of Pat O’Neill’s “The Decay of Fiction” in 2003. So, the film and media tracks started coming together, and now part of my focus is on the intersection of technology and screen-based media. In addition to the media market that the San Francisco Bay Area comprises, San Francisco is a vital proving ground for innovations in aesthetics and technology. SFIFF provides a terrific forum for seeing how film production is being shaped worldwide. The city is one of the most beautiful and iconic. Our creative director Miguel Pendas leads tours on VERTIGO and film noir locations each year for visiting guests, always a favorite. Of course, it’s the people who make the city, and San Francisco is one of the most film literate communities in the world. 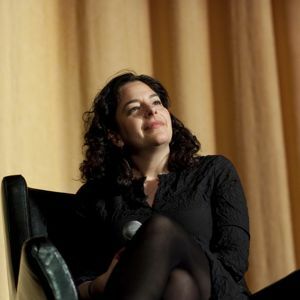 The festival presents open and intelligent exchanges between audiences and filmmakers. SFIFF is one of many events that the SF Film Society presents year-round. While SFIFF will continue to be a vital zone of intensity in the work of the Film Society, we expect the rest of our year-round activities and film culture in San Francisco generally to continue rising up to the importance of the festival. Media technologies, and specifically the proliferation of media outlets, will certainly play a major role in the shape and relevance of festivals and media exhibition organizations. One way that we are investigating those changes is through the establishment of a year-round series titled KinoTek. The series is supported by the Warhol Foundation and will present eight emergent and cross-disciplinary media projects in 2011 and 2012. SFFS also has established a robust education department and a grants, residencies and fiscal sponsorship arm that aims to broaden the avenues for filmmakers and film viewers to discover, create and enjoy movies. If your film is rejected, it isn’t necessarily a statement on the worth of your work. We get many, many entries, and we are able to present a mere fraction of what we receive. Don’t underestimate the importance of submitting a full and clear application. We don’t ask for information that we don’t find useful in making decisions. We don’t have specific criteria outside of quality. I think that different programmers are more interested in different ideas, and we try to alert each other of work that would engage our varying interests. For my part, one major role I see for SFIFF is to provide a social context for understanding developments in aesthetics and communication – both for artists and for the public generally. So, I tend to gravitate towards work that pushes boundaries and will spark a conversation. I am not at all into the idea that endurance is a necessary precursor to enlightenment. In other words, it’s okay if work is challenging and entertaining. I loved the live music and silent film presentations we presented with Stephin Merritt/20,000 Leagues Under the Sea, Black Francis The Golem and Dengue Fever/The Lost World for the past few years. I thought “To Die Like a Man” was amazing. A movie I would have liked to present was Double Take by Johan Grimonprez. My oldest brother instilled in me a passion for film at a very young age. He was a film major at UCLA in the late ‘60s and introduced me to the works of Truffaut, Godard, Kurosawa and countless other film legends when I was growing up in the sheltered environment of Orange County. I fled to Los Angeles after high school and majored in English at UCLA, but spent most of my time in Melnitz Hall watching films from the UCLA TV and Film Archive and taking film theory classes taught by Robert Rosen and Bob Epstein. Golden Gate Awards Manager Audrey Chang. Image courtesy of SFFS. After a short stint working in a small publishing company in San Francisco, I moved to Boston and started working in the film department at WGBH in 1984, where I decided to pursue a career in editing. I moved to New York in 1986 and got my first job as Assistant Picture and Sound Editor on Barbara Kopple’s film, “American Dream.” New York in the ‘80s was a mecca for independent filmmaking and I was fortunate to have learned from some incredibly gifted editors, including Larry Silk (“Pumping Iron,” “Marjoe”), Tom Haneke (“From Mao to Mozart”), Cathy Caplan and Ila von Hasperg who was Fassbinder’s and Daniel Schmid’s editor in the early ’70s. After completing “American Dream,” I moved back to Los Angeles in 1991 and continued working in post-production. My passion for editing waned as AVIDs replaced flatbeds in cutting rooms during the mid to late ‘90s, but it wasn’t until 2005 that I decided to start over and move to San Francisco. I started at SFFS in 2006, overseeing festival submissions and the Golden Gate Awards competition. My role has evolved to participating in the selection of documentary features and narrative/documentary shorts for Golden Gate Awards. Being the longest-running festival in the Americas, SFIFF is unique in that it combines a distinguished and storied history while still being open to new directions in creative expression and new technologies. SFIFF also provides an intimacy and ample opportunities for discussion between filmmakers and audiences that is refreshing. In the face of the glut of over budgeted and inflated concept films and remakes coming out of the major studios, SFIFF and our fellow festivals are not only vital to the visibility and viability of independent and moderate to low budget films, but we have evolved to be the first, and in many cases the only venues, for these works to be seen on the large screen by a significant audience. My recommendation is to submit the strongest cut possible. Although we do accept rough cuts or works in progress, our screeners review hundreds of entries over a 3-month period and make recommendations based on what is presented, so take your time and send us what you consider to be a fine cut of your work. Read/follow entry guidelines carefully, expect to pay entry fees and budget accordingly. Do your homework – research and view films that have played in past festivals to gauge the type of work that is programmed. I don’t know if there are any specific criteria in selecting films. My personal feeling, having observed and participated in the selection process for close to five years now, is that I find the process of editing a film is similar to programming in that it is a collaboration between trusted colleagues and advisors who through discussion and debate create a final product that is balanced, adventurous and innovative. The city of San Francisco is an integral part of SFIFF’s success. San Francisco has always been a step ahead of other cities in terms of its politics, art and culture and SFIFF matches the spirit of the city in its innovation and daring.